Into the Woods | Are you ready? Home » Blog » Into the Woods | Are you ready? Heading into the woods, wetlands or prairies for your first, or first-in-a-long-time hike? Are you wondering what to bring, wear or what you’ll see or do in an ACRES preserve? What to bring? You really only need to bring your curiosity, awe and gratitude. If you’re not feeling these attitudes, perhaps the trails will bring them up for you. Every leaf, berry, animal sound, track and tree; each flower, rock, insect, sensation and the wind itself has the potential to capture your attention, inspire questions and provoke your innate capacity for joy and calm. How will you find your way? ACRES trails are mostly loop trails, easy to follow and will get you back to your vehicle. Before you go into the preserve, it’s helpful to notice the land and landmarks around you. Are you surrounded by fields? A road? If so and in the odd chance that you lose the trail, you could find the edge of a preserve and follow it back to the entrance. 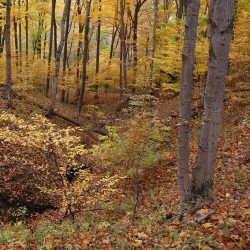 You can also use free trail maps on our website (acreslandtrust.org/preserves). Image 1 – You can find a map of each preserve trail at the bottom of the preserve page. 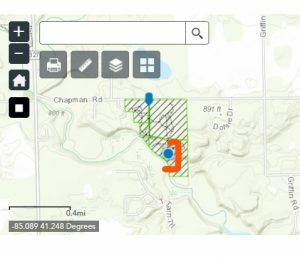 If you click the “My Location” button (highlighted with orange above), you can see where you are on the trail. See image 2. 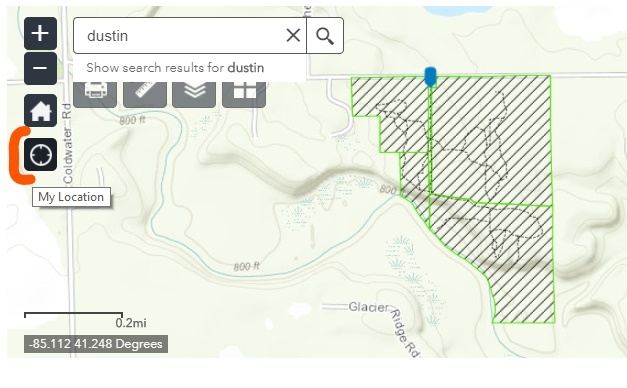 Each preserve has its own web page with a live, interactive map at the bottom. If you take a smart phone on your walk, this map can show you where you are on the trails. Just pull the map up and select the “radar-like” button to the top left of the map display (Image 1, above). If your phone’s location setting is on and if you have internet service, your location will appear on the map (see Image 2 above) and follow you along the trails. If you don’t have a smart phone or a map, or if you intentionally want to leave them behind, you can simply follow the trails to get back to your car. 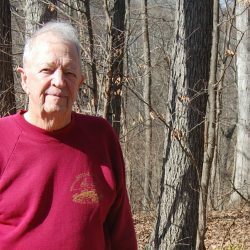 What are preserve trails like? 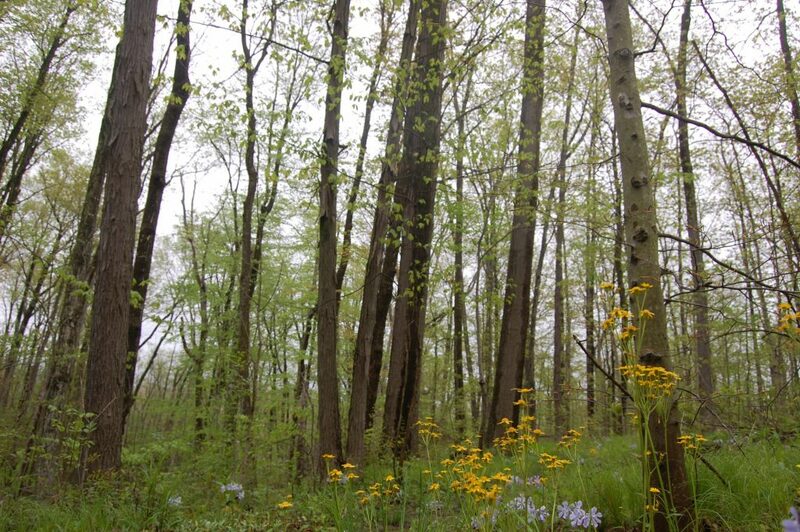 ACRES preserves are wet, wild and wonderful. The trails are natural, not paved and not covered with mulch or stone. They are dirt, sometimes mud. Sometimes you will step over or under fallen trees. In the growing season, our grass trails are mowed, often by volunteers, once a month, so the grass might get a little long. In the woods, you will find roots and rocks in your path. You might even want to peek under logs to the side of the trails – what might be living there? What else might help? As with any outdoor activity, dress for the weather. Has it been raining? Consider your shoes, as ACRES trails are natural and can be muddy. Some people like to wear hats for protection from sun and from bugs in the summer. Depending on the time of year and sometimes on the place, you might wear bug spray. Wet summer woods tend to be buggier than, say an open prairie in the spring or fall. Consider your time, too. ACRES allows about 90 minutes for our guided hikes; some trails are much shorter and you can always choose to take a quick hike. What can you do in these natural places? Follow your own interest: notice shapes, sounds, smells, tree textures, animal prints. Go as slow or as fast as you’d like. Go alone, with family or friends, or walk your dog on a leash. Follow the rules to help protect the place: stay on the trails, foot traffic only, take nothing leave nothing and visit only from dawn to dusk. What do you need to enjoy a walk in the woods? A friend, or sister, might help! Photo by Bonnie Fortune. 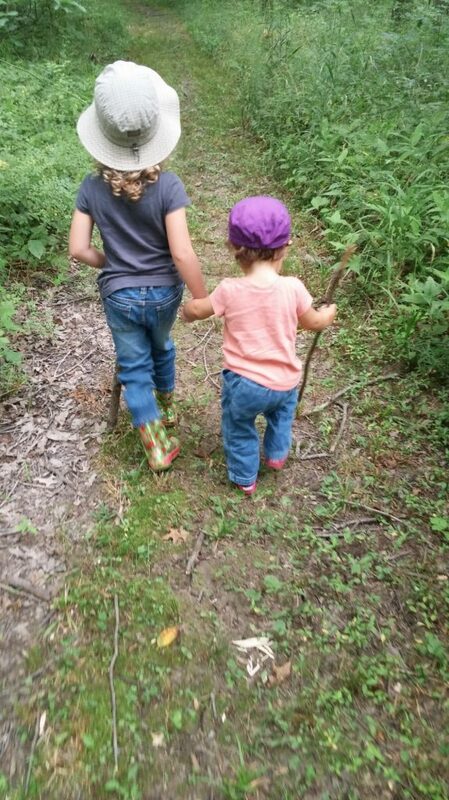 Our questions about going into the woods (or wetlands and prairies) are quite telling about how you and I relate to the natural world. In a way, our questions show us how far removed we can be from the rhythm and once-basic understanding of the land and living things. At their essence, these questions come down to one question: What do I need to take a walk? When put like this, it sounds funny, right? This is, in part, why a group of folks came together in 1960 to create a nonprofit with the mighty goal of protecting natural places forever. 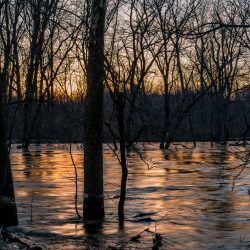 ACRES Land Trust’s founders realized that a number of folks no longer felt a direct, personal awareness, connection or appreciation for natural places. 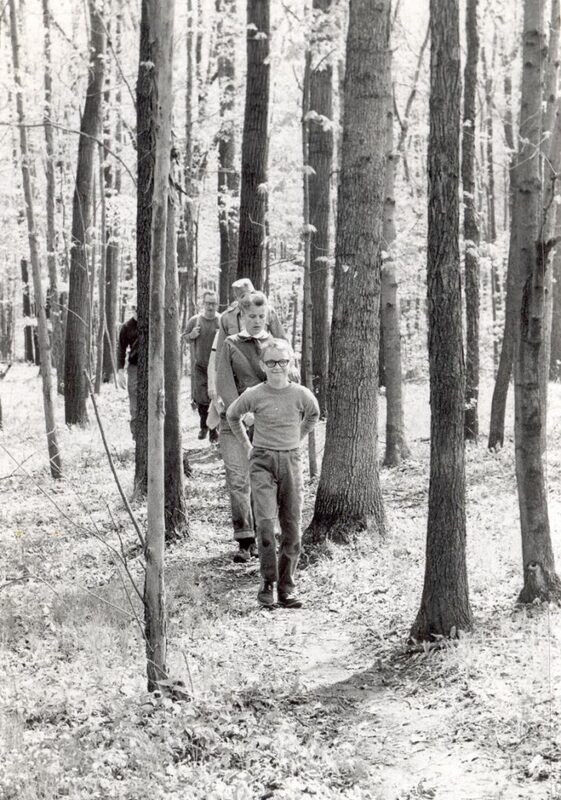 They saw how easily we can lose touch with the woods and they knew, too, how essential this connection and healthy natural areas are to our daily lives. More specifically, our founders saw that people needed help to keep some of these places healthy and safe, so they called on folks like you and built this organization from the ground up to protect land. You can enjoy the fruits of this labor and you can certainly help ACRES grow by participating.